In Advertising > Show & Tell and Coin Operated > Still Banks > Show & Tell. Interesting older molded Mr. Peanut bank. Maybe '70s or a little older? I'm not really sure about the age. It's exactly 8 1/4" tall. Hope you all enjoy! Thank you Kerry! And thank you aghcollect and Roy! I'll have to ask my older bro and sister because maybe it was theirs not mine - I remember a bank - it would have been in the late 60's. Thanks valentino, I appreciate that. I always appreciate more info! Thanks again Kerry, that seems pretty likely. aycockonxion, you are correct about the '70's. here is a yellow one with alarm clock & wristwatch. My brother had one just like this, except it was green. Definitely early 70s. Thank you to blunderbuss, AzTom, DrFluffy for the loves! Thank you to Manikin, pw-collector, and bratjdd for the loves! Thanks to tom61375 and RAD21289 for the loves! Do I remember right? Wrappers from Planter Peanuts were sent in w/some $ for this bank? I wouldn't be surprised, that would make sense. The money just for S&H probably? And thanks to gargoylecollector, Trey, and geo26e for the love! 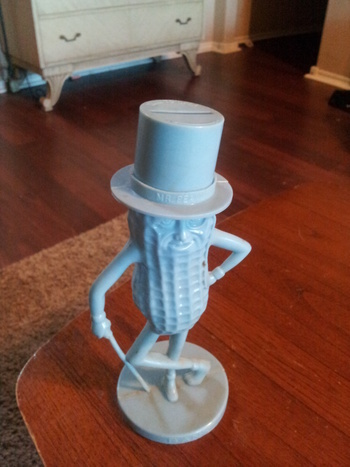 Loved my Mr. Peanut. I had this one in blue and it would have been late 50s or early 60s. My husband's was red, but then he wasn't my husband then. ;) But it did make it to our house 10 years later. :) Nice find. Thank you for the love and the nice comment Parkerhouse!! Thanks for the love officialfuel! Much appreciated. I sent in the wrappers and I think thirty cents in 1958. I also had a tan (peanut color) drinking cup. 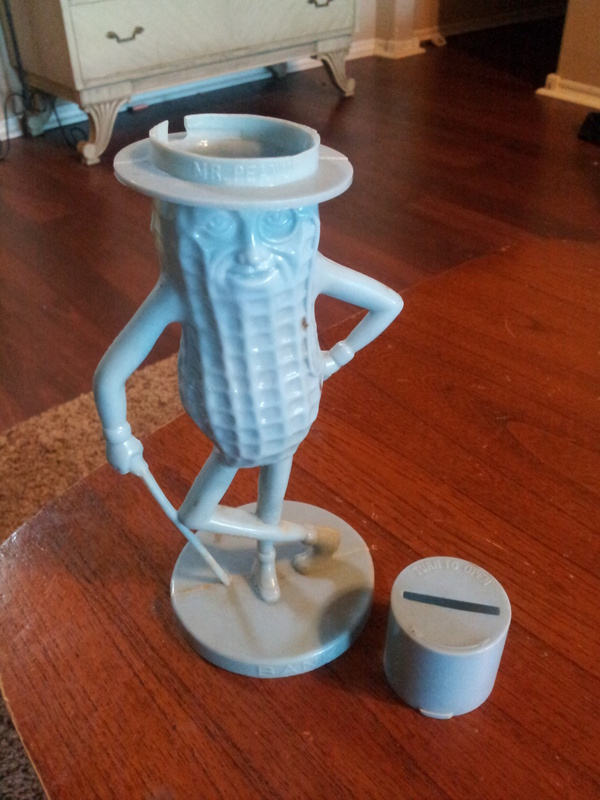 The bag of peanuts cost five cents so getting something for the wrappers was a big deal. Five cents was big money to a kid back then. Although you could still buy penny candy and gas was eighteen cents a gallon.